Campers don’t want to spend their summer in the nurse’s office. 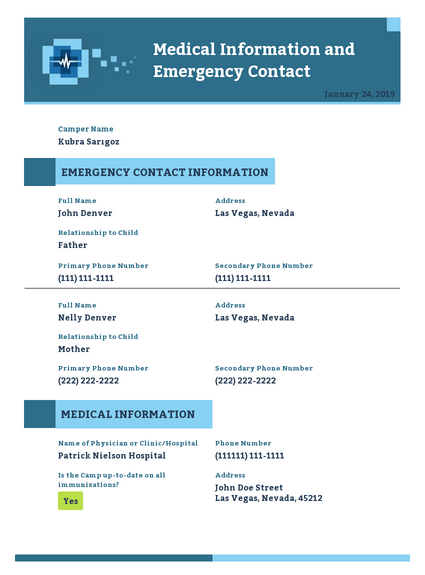 To protect campers’ health and safety, this Camper Health History PDF Template collects information about existing medical conditions, allergies, dietary restrictions, immunizations, medication instructions, and emergency contact numbers. If you’d like to customize the template, you can add more information categories or your camp’s logo using JotForm’s PDF Editor. With a Silver or Gold plan, you’ll be able to make this form HIPAA-compliant and keep sensitive health information safer than ever. All submissions will automatically be saved as mobile-friendly PDFs camp staff can instantly download and share. Once downloaded, these PDFs can be accessed on any device regardless of WiFi availability, so you’ll be prepared to handle any medical situation no matter where you are. Is the Camp up-to-date on all immunizations? Does your child have any food, medication or environmental allergies? Does your child’s allergy/allergies require child care staff to monitor child for symptoms, take action if a reaction occurs, or give emergency medication to your child? Does your child have a special health or medical condition? Does the special health or medical condition require child care staff to perform a procedure, or perform child specific care such as: to monitor your child for symptoms or administer medication during child care hours? Is your child currently using any medication, food supplement or medical food (such as electrolyte solution)? Does your child have any dietary restrictions, including those for medical, religious or cultural reasons? Does this dietary restriction require a modified diet that eliminates all types of fluid milk or an entire food group? List any history of hospitalization, outpatient surgery, or previous health concerns that would be needed to assist the staff or medical personnel in an emergency situation. List any additional information about your child that would be useful for staff to know, such as fears, eating or sleeping habits, or special routines. This information should not be medical or health related, as that information should be included in the previous questions.